How long you had your Yaris? Nearly a year. It's my first car and it's been faultless! I think the pollen filter is accessed just behind the main glovebox compartment. The 1999 - 2005 models are really quite old now though I think they're still famed for their reliability. I got my D-4D Yaris 6 months ago (1st gen, 2005) with just 33k miles on the clock and it's been fantastic so far. I think if you look for a well-looked after example, a late 1st gen would do you better on reliability alone. If it's low mileage, make sure services are completed on a time basis, rather than just mileage. I think £2k will get you a really neat example as mine cost just a tad more than that. 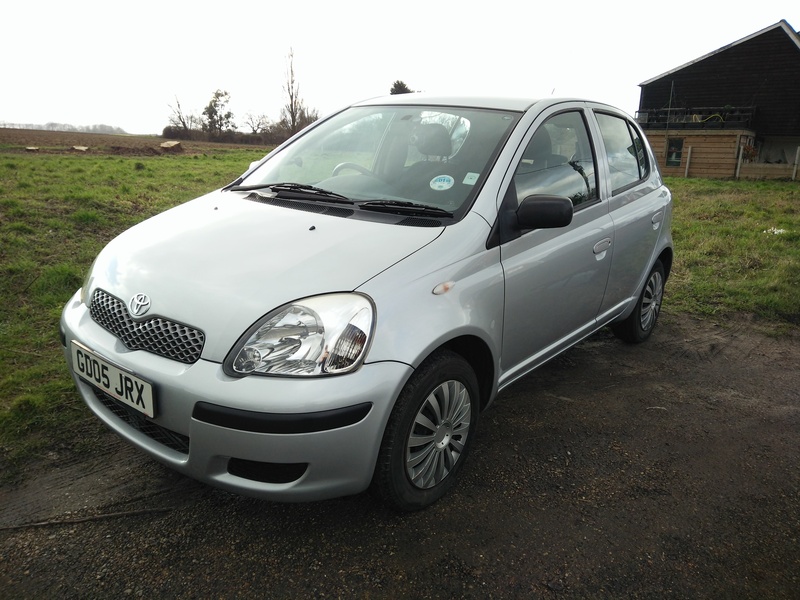 Car: 2005 XP10 (1st gen), P2 (japanese built), T3 Yaris D-4D, stock interior. Before I purchased my dashcam (a Z-edge Z3, for the curious - it works great!) I scoured the forums for advice fitting it into the Yaris, because a lot of the fabric, or undoable trim where a wire could usually be tucked into in other cars, are hard plastic on this one. Before I found the "best route" I found today, I had the wire go through the transmission tunnel, under the passenger side rear foot mat, and up, running parallel to the passenger seatbelt, and up through the top roof upholstery. The issue with that route was obvious: the wire could be seen from the back, right from the roof down to the floor mat, and, more alarmingly, rear passengers would sometimes trip up on said wire. Okay, so the first image shows where I begin: the USB plugged into the cigarette lighter socket: (if you're wondering, that's a bluetooth to FM thingy) As you can see the wire travels to the passenger side, where it then goes underneath the passenger mat (removed for demonstration): Next you can sort of "unclip" the plastic connected to the foot guard protector, and slip the wire underneath and through. To clip it back on simply push it back down and in once the wire's in. If it doesn't click shut, move the wire around a bit to avoid obstructing the clips: Here we can see where the wire enters and then exits, making it nice and neatly hidden: A close-up of the wire exiting (ignore the crap stuck to it): The wire then travels up in front of the passenger side seatbelt. This is the only wiring really visible, about 60cm: Following up, the wire then enters the bit of rubber housing as shown here. It was fairly easy to stuff the wire inside: The wire goes up through that rubber housing adjacent to the plastic trim, and then continues around the corner where it meets the fabric roof liner. It's fairly simple to stuff the wire under the fabric liner, and just needs tucking back in. The setup I had included this bit - going through just where the fabric liner is. Following the same method I had before also, the wire exits the fabric trim early, like so: For the next bit I found the best way is to tuck the wire into the passenger sun guard - tucked in so it can still be used. When opened the wire stays in the same place: Last but not least, there's a short travel to the dashcam itself. In this position the dashcam is mostly concealed by the rear view mirror (from the driver's seat view). The wire doesn't hinder or interrupt any windscreen space. Thanks for following and I hope it's useful to people! Any questions or image requests feel free to ask. I do wonder if the fact that they've used a comparatively high-displacement engine will make the Gazoo Yaris considerably heavier. A lot of current T-sport owners enjoy the Yaris because of its nimbleness than its outright power. Colchester toyota - any reviews? I'm quite impressed by the value that the "gold" service plan includes for older cars but I've heard mixed things about the Colchester Toyota service centre online - does anyone here have any experiences with them? thanks! with the seats back up the sound disappeared. So recently I've had the back seats folded down to move stuff and I've kept them down - in the week i don't usually have passengers. But for some reason with the back seats down I can hear fluid sloshing about near the back which i can only assume is the fuel tank, is that normal? usually with the seats up I can't hear it at all do the seats really make that much noise insulation? Thanks for the reply Madasafish - very helpful and I found my service booklet. I recently hit 40,000 miles (currently now at 40,100) and was wondering how urgent the gearbox oil replacement needs to be. I had an early service at 36,000 miles for fuel/air/oil filter/flush since I became the owner. Thanks for your help.